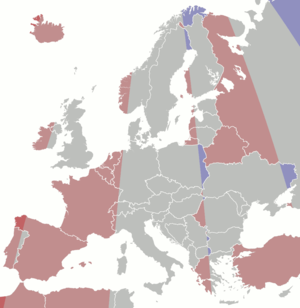 This article is about the time zone with daylight change in Europe. For the static time zone, see UTC+2. 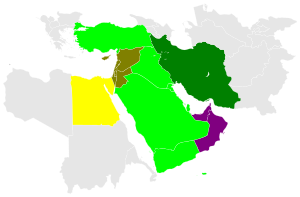 Egypt, since 21 April 2015; used EEST (UTC+02:00; UTC+03:00 with daylight saving time) from 1988–2010 and 16 May–26 September 2014. Kaliningrad Oblast (Russia), since 26 October 2014; also used EET in years 1945 and 1991–2011. See also Kaliningrad Time. Libya, since 27 October 2013; switched from Central European Time, which was used in 2012. Used year-round EET from 1980–1981, 1990–1996 and 1998–2012. Moscow used EET in years 1922–30 and 1991–92. In Poland this time was used in years 1918–22. In time of World War II, Germany implemented MET (CET) in east occupied territories. Republic of Crimea and Sevastopol used EET as part of Ukraine between 1991-94 and 1996-2014. Turkey, used EET in years 1910-1978 and re-used it again in years 1985-2016. Now uses year round DST timezone called Further-eastern European Time or Turkey Time (TRT). Sometimes, due to its use on Microsoft Windows, FLE Standard Time (for Finland, Lithuania, Estonia, or sometimes Finland, Latvia, Estonia) or GTB Standard Time (for Greece, Turkey, Bulgaria) are used to refer to Eastern European Time. These areas have sunrises and sunsets at least half an hour earlier than places on the UTC+01:00 meridian. The easternmost part of North Macedonia, including the city of Strumica. The absolutely easternmost part of Serbia, in the Pirot District, including the city of Pirot. The northeast of Norway, lying north of Finland, roughly coinciding with the county of Finnmark. The easternmost town in Norway, Vardø, lies at 30°51' E, which is located east of even of the central meridian of UTC+02:00, i.e. east of Istanbul and Alexandria. The Norwegian-Russian border is the only place where CET (UTC+1/+2) borders Moscow time (UTC+03:00), resulting in a one (or two in winter) hour time change when crossing that border. There is a "tri-zone" point (where UTC+1, UTC+02:00, and UTC+03:00 meet) at the Norway-Finland-Russia tripoint, near the town of Rayakoski. Belarus is located between 23°11′E and 32°47′E and is thus fully located with the physical UTC+02:00 area, but it uses UTC+03:00 year around. Practically all European Russia west of Moscow (except Kaliningrad Oblast); this includes the chunk of land from Murmansk all the way south to Belgorod, including the cities of St. Petersburg, Novgorod, and Pskov, to name only a few. (The westernmost point of contiguous Russia, near Lavry, Pskov Oblast, 27°19' E, is the westernmost point in European Russia where UTC+03:00 is applied.) This also includes the city of Anapa, at the westernmost tip of the Krasnodar Krai near the entrance to the Sea of Azov, at 37°22' E.
The Norway–Russia–Finland "tri-zone" point at Muotkavaara (see Central European Time) is surrounded by three different times in winter, two in summer. It had three time zones year-around before 2014. Two of the four tripoints of Belarus and the tripoint of the Kaliningrad Region are surrounded by three different times in winter. ^ "CAT – Central Africa Time (Time Zone Abbreviation)". www.timeanddate.com. Retrieved 2019-04-10. ^ "EET – Eastern European Time (Time Zone Abbreviation)". www.timeanddate.com. Retrieved 2019-04-10. ^ "Eternal Daylight Saving Time (DST) in Belarus". ^ "Finland Latvia Estonia Time". TheFreeDictionary.com.